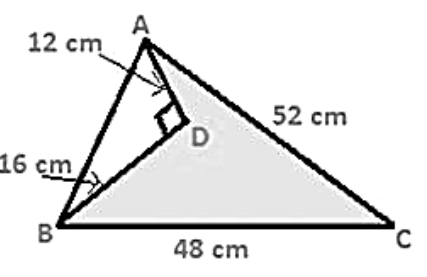 Find the area of a triangle whose sides are respectively 150 cm, 120 cm and 200 cm. Let the sides of the given triangle be a, b, c respectively. Find the area of a triangle whose sides are respectively 9 cm, 12 cm and 15 cm. Whenever we are given the measurements of all sides of a triangle, we basically look for Heron's formula to find out the area of the triangle. In a triangle ABC, AB = 15 cm, BC = 13 cm and AC = 14 cm. Find the area of triangle ABC and hence its altitude on AC. Let the sides of the given triangle be AB = a, BC = b, AC = c respectively. The perimeter of a triangular field is 540 m and its sides are in the ratio 25: 17: 12. Find the area of triangle. The perimeter of a triangle is 300 m. If its sides are in the ratio of 3: 5: 7. Find the area of the triangle. The perimeter of a triangular field is 240 dm. If two of its sides are 78 dm and 50 dm, find the length of the perpendicular on the side of length 50 dm from the opposite vertex. A triangle has sides 35 cm, 54 cm, 61 cm long. Find its area. Also, find the smallest of its altitudes? The altitude will be smallest provided the side corresponding to this altitude is longest. The lengths of the sides of a triangle are in a ratio of 3: 4: 5 and its perimeter is 144 cm. Find the area of the triangle and the height corresponding to the longest side? The perimeter of an isosceles triangle is 42 cm and its base is 3/2 times each of the equal side. Find the length of each of the triangle, area of the triangle and the height of the triangle.